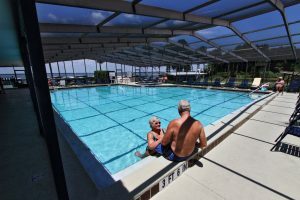 Gated communities have become popular for people of all ages in Central Florida, but they’re particularly appealing for residents 55 and older who like the peace of mind that comes with living in a restricted-access community. Whether you’re a seasonal resident, a retiree on the go, or you still have a stake in a career, you’re looking at gated communities as you search for a place to call home because security is a priority for you when you’re at home and away. But your evaluation shouldn’t stop at the gate. You’ll want to consider what else you get for your investment, including whether you’ll be able to enjoy an active lifestyle that fits your budget. And that’s where Lake Griffin Harbor shines among gated communities in Central FL. Our age-restricted community of high-quality manufactured homes is perched right on the edge of magnificent Lake Griffin, which stretches seven miles and connects to other waterways in a chain of lakes that offers endless opportunities for boating and fishing adventures. We make the most of that, too, with a boat launch, 55-slip marina, and a spacious clubhouse complex with an observation deck that offers stunning views of the waterfront. In addition, our community of well-maintained manufactured homes offers all the comforts of gated communities with traditional site-built houses, but manufactured homes typically come with a substantially lower price tag, which helps you enjoy an active lifestyle that’s also affordable. We’re confident that Lake Griffin Harbor has everything you’re looking for and more as you peruse the options in gated communities in the Central FL area. So take the next step. Contact one of our Lifestyle Consultants today to schedule a tour of our beautiful waterfront community.